Only 7 days left for early-bird savings. Do not forget to register for the 27th IUGG General Assembly before the early-bird deadline closes at 23:59 (EDT) on April 9. Workshops and Fieldtrips are online! Book your room today to benefit from the preferential rates negotiated for the conference. Rates are starting at $94.00 Canadian, per night. See the website for additional details about each hotel and how to book your accommodation. The deadline is March 1st, 2019 (12:00 CET). Don’t miss your chance to be part of the 27th IUGG General Assembly! To submit an application for a travel grant to attend IUGG2019, please click here. Deadline to submit a travel grant application is March 1st, 2019 (12:00 CET). Formed in Brussels, Belgium, on 28 July 1919, the International Union of Geodesy and Geophysics (IUGG) celebrates its 100th anniversary in 2019. The centennial year marks an important milestone for IUGG. Since its inception as a union of international scientific associations, IUGG has evolved into a prominent scientific organization promoting Earth and space sciences worldwide in the complex political, economic and scientific landscapes of the 20th and the beginning of the 21st centuries. IUGG’s mission is to advance, strengthen and promote Earth and space sciences for the benefit of humanity through international research cooperation and education, and to communicate the knowledge to governments and policymakers. For the decades ahead, IUGG envisions a future Earth that is environmentally sustainable and where societies are resilient against natural hazards. We celebrate the IUGG centennial not only to remind geoscientists how important international scientific cooperation is and how IUGG science and science diplomacy have developed over the last century, but also to think collectively about future scientific developments, international scientific initiatives, and finding solutions to the urgent problems of our society, especially to those related to the 2030 UN Agenda for Sustainable Development. We are looking at the past in order to develop a new future for Earth and space sciences and to promote science for the benefit of all. As a part of this program, a website dedicated to the IUGG Centennial has been developed and is now open to the public. Please visit http://100.iugg.org/ to learn more about the history of IUGG. We hope all visitors to the website, especially IUGG scientists from all nations and geoscientific disciplines, will enjoy this wonderful 100-year journey through space and time and appreciate the work of several generations of Earth and space scientists, who voluntarily contributed their time and efforts to the development of international cooperation in geosciences. Deadline for Abstract submission and Travel Grants has been extended to March 1, 2019 at 12:00 Central European Time (CET). The extension is to accommodate many researchers, who have been affected by technical difficulties, and national governmental regulations. Please note that, if you need a visa to enter Canada, the necessary letter of invitation will be generated when registration and payment are complete. We therefore encourage delegates to register as early as possible in order to start their visa application process. 5 days left for abstracts submission and travel grant! Abstracts submission deadline – 5 days left! The deadline is on February 18, 2019, 23:59 (or 11:59 PM) Pacific Time. Travel grant deadline – 5 days left! (or 11:59 PM) Pacific Time. 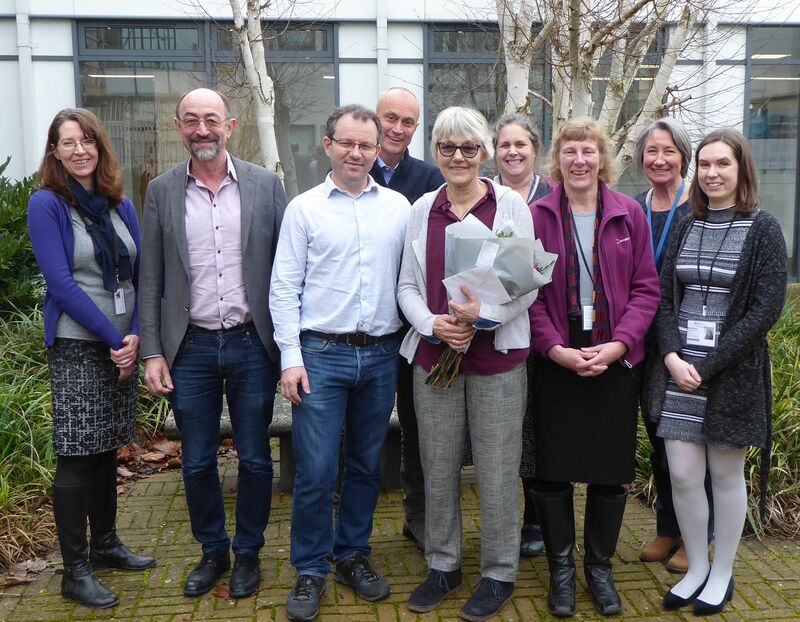 IAHS is delighted to be able to show our appreciation to Frances Watkins for her 25 years of devoted service to IAHS and HSJ. 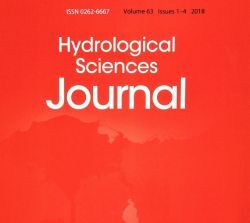 Hydrological Sciences Journal (HSJ), the official journal of the International Association of Hydrological Sciences (IAHS), is over 60 years old and is celebrated worldwide as a truly international hydrological journal. HSJ has seen many changes of Editor and Editorial Board over the decades but has relied on the constant,­ steadying hand of Frances since her first appointment as Assistant Editor in 1993 through to her taking up the position of Editorial Manager in 2003, a role which she continues to fulfil. In 2022 IAHS will celebrate its 100 years anniversary, so it’s wonderful to think Frances has been a part of our family for over a quarter of that span. The IAHS office, Association and the journal have undergone many changes in that time, not least of which has been a technological revolution within the world of publishing over the last 25 years. 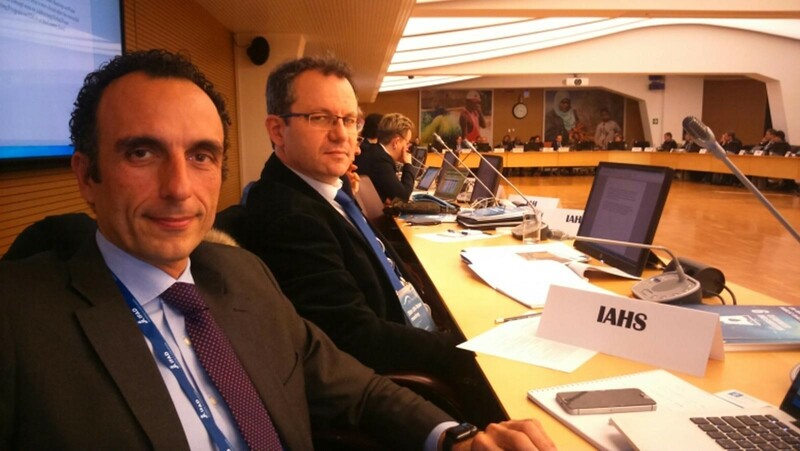 IAHS Secretary General Christophe Cudennec and IAHS Statistical Hydrology Past President Salvatore Grimaldi represented IAHS at the UN Water meeting in Rome this week. 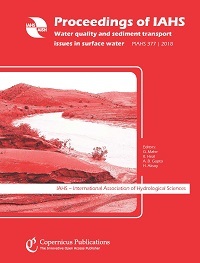 The annual subscription is now due for Volume 64 (2019) of Hydrological Sciences Journal. Volume 64 remains at 16 issues but we are pleased to announce that the annual subscription rate remains the same. The Impact Factor is 2.061 with a 5-Year Impact Factor of 2.274 (©2018 Clarivate Analytics, 2017 Journal Citation Reports®). Volume 64 will continue to publish a special series of invited opinion papers directly linked to the IAHS "Panta Rhei" initiative that will be collated in the online virtual special series. Discussions and replies on these opinion papers will also be published. · Hydrological change in Chinese rivers (Panta Rhei in China meeting, October 2017; Guest editors: Yangbo Chen, Yangwen Jian and Marco Borga. Submission closed. Likely publication in mid-2019. · Hydrological Data: Opportunities and barriers; Guest editors: C. Cudennec, B. Arheimer, H. Lins, and S. Uhlenbrook. Deadline for submissions 31 March 2019. "Beyond 100: The next century in Earth and Space Science"
We look forward to welcoming you to Montréal in 2019. Please sign up on the main web page if you would like to receive newsletters and updates for the conference. The MOXXI 2019 International Conference will be hosted at New York University (Kimmel Center, 60 Washington Sq. South Suite 605, New York, NY 10012) from March 11th to 13th in collaboration with the Citizen AND Hydrology (CandHy) working group of IAHS, the World Meteorological Organization (WMO) HydroHub, and the Consortium of Universities for the Advancement of Hydrologic Science, Inc. (CUAHSI). The conference welcomes contributions from practitioners, innovators, data managers and assimilators, as well as researchers in hydrology and other fields. Contributions by experts from National Meteorological and Hydrological Services are particularly welcome. IAHS are pleased to announce the launch of the new SYSTA Sivapalan Young Scientists Travel Award / Bourse de voyage pour jeunes scientifiques. SYSTA awards are available to eligible early career scientists attending IAHS events and who grew up and now reside in a financially disadvantaged country. Typically IAHS intends to make around 20 awards per year. The first IAHS meeting for which SYSTA support is available will be the 27th IUGG Assembly in July 2019 in Montreal, Canada. The deadline for applications for support for the 2019 IUGG Assembly is Tuesday 13 November 2018 at 12 noon GMT. Applications can be made in English or French. The award will be limited to a maximum of €2000 per individual covering registration fee, visa fee (if necessary), accommodation and transport. The 3rd IAHS Panta Rhei Conference will take place in Harare, Zimbabwe from 25-27th October 2018. Abstract submission and registration are now open. Thank you for your interest in STAHY-2018 in Adelaide Australia. As noted on the website, we are planning to hold a Spring School in association with the STAHY workshop. The lectures will be delivered in an informal settings to encourage interaction and discussion, and will be delivered by Mark Thyer, David McInerney and Dmitri Kavetski. Note that the Spring School will have a fee of AUD 100 in order to cover the basic running costs. This fee is separate from the STAHY registration fee, which covers the 3 STAHY workshop days (24-26 Sept). For example, the assimilation of data from new observation technologies is an expanding issue which has given rise to activities and efforts within the scientific community, the operational services and the facilitating mechanisms of the United Nations towards measurements and observations in the twenty-first century, innovative water monitoring capabilities and data exchange, virtual labs to facilitate observation-modelling progress; as well as an array of efforts involving citizen science, simple and inexpensive instrumentation, remote sensing innovations, and studies involving the comparative assessment of using a limited number of research basins versus a relatively large number of management basins (e.g., PUB and its ongoing follow ups). Similarly, data assimilation among various system components in the modeling of hydroclimatology and hydrometeorology, and their interfaces with the land surface, ecological and social systems, and others is moving forward – especially within the framework of the Panta Rhei initiative. Moreover, the emerging focus on the water-food-energy nexus reflects not only the increasing demand for data within each sector, but for viable approaches to their integration that ensure water and food security, sustainable agriculture, and energy production worldwide. The recent discussions of big data and emerging efforts associated with the shaping of "data science" are crucial concerns for the future of hydrology and should be explored. Also, a number of concerns dealing with retrospective investigations are data-dependent, with particular worries related to data archiving and data rescue. Moreover, hydrological data are typically obtained through a combination of observations and computational algorithms. For example, river discharge is most often estimated from water level via a rating curve; multi-spectrum analysis of satellite data is frequently combined with multiple information sources to produce a variety of Earth observation products; and observed time-series are used to estimate parameters in complex dynamic hydrological models. As a result, the boundary between observed and computed data is often vague and, considering the degree to which such data are shared, re-used and cited, it can be difficult to trace their provenance. Notably, a strong and vigorous debate on data could be critical to the development of new policy messages regarding observing networks; i.e., their density, quality, sustainability, investment, modernization, etc. Such a debate may also serve as an important contribution to the development of inputs from the hydrological sciences to achieving the Sustainable Development Goals that, at their core, are data dependent, especially along the observation-knowledge-indicator-target value chain. The data issue is an increasingly import aspect of the publication industry, where inveterate concerns over open access to data have long vexed the community. The emerging interest in providing datasets as supplementary materials to papers is an encouraging sign, and periodicals like the Hydrological Science Journal take this opportunity to develop and promote such policies for their operations. IAHS could use this Special Issue as a basis for developing new and related portals on iahs.info . Finally, it is critical that corresponding competencies in hydrology be identified for education and capacity building, particularly with respect to data issues. Numerous organizations are working on these issues and contributions reflecting new efforts in this area are of particular interest. 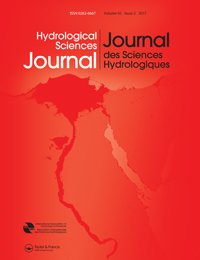 Submission is welcome by 1st November through the Hydrological Sciences Journal online platform. We strongly encourage potential authors to contact first the Managing Guest Editor at cudennec@agrocampus-ouest.fr to inquire about the suitability of their manuscript and about any innovative concept. Accepted papers will be immediately published along the flow. Paris, 4 July 2018 - In a historic meeting, the International Council for Science (ICSU) and the International Social Science Council (ISSC) merged today to form the International Science Council, a unique global non-governmental scientific organization representing both the natural and social sciences. The meeting opened with addresses from Catherine Brechignac, Secretaire Perpetuel of the French Academy of Sciences. In her speech, Brechignac, who is a former President of ICSU, emphasised that the “natural sciences should no longer dictate the Earth system sciences research agenda, social sciences should be at least as important.” Prince Albert II of Monaco welcomed the participants of the ISC General Assembly in the “Maison des Océans”. A friendly reminder to submit your abstract for STAHY 2018, the submission deadline has been extended until 22 July 2018. We look forward to seeing you in Adelaide, South Australia from 24-26 September 2018. All abstracts are welcome and should conform to the required format and be uploaded to the online submission system. Registration is also now open, the portal and information are available here. The Early Bird Registration deadline is 31 July 2018. 100.000 CHF seed-funding will be provided to sustainable solutions that can be up-scaled around the world. - Maximizing impact on the ground through the creation of local income from sales and services generated by the awarded solution. 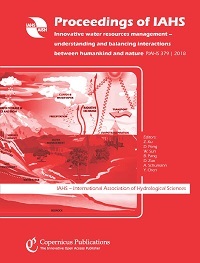 The 8th International Water Resources Management Conference Beijing, China, 13–15 June 2018 Innovative Water Resources Management in a Changing Environment – Understanding and Balancing Interactions between Humankind and Nature papers are all available open access as PIAHS Volume 379. Panta Rhei Scientific Decade (2013–2022) of IAHS. Efficient adaptation requires gaining a forward vision on future water demands and water availability. A deep understanding of the two-way interaction between nature and humankinds is needed to develop such vision. The IAHS is pleased to announce that the three volumes of Proceedings of the International Association of Hydrological Sciences from the July 2017 IAHS Scientific Assembly in Port Elizabeth, South Africa are all now available online open access. Understanding spatio-temporal variability of water resources and the implications for IWRM in semi-arid eastern and southern Africa. 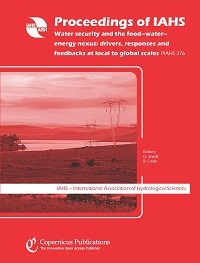 This volume contains 14 peer-reviewed papers that focus on integrated water resources management in the southern Africa region and are a culmination of extensive research in five broad themes, namely, (1) hydrological modelling (2) groundwater hydrology (3) application of earth observations in water resources assessments (4) water allocation and use and (5) water quality management. Southern Africa offers wide research opportunities to solve challenges related to the assessment of surface and groundwater resources, water supply and sanitation, water pollution and allocation. However, data scarcity and difficulty in accessing research sites discourage many research efforts. The papers in this Volume are research outputs from mainly postgraduate studies conducted at universities in southern Africa with the sole aim of contributing to knowledge in water sciences that will facilitate informed decision-making and policy formulation by water managers and practitioners in the region. Water quality and sediment transport issues in surface water. Sediment transport and water quality are modified by human activities all along river courses. If research focuses only on pristine basins and large dams, little is known about the quality of the waters flowing to the sea. Most rivers around the world are regulated to some extent by hydraulic infrastructure, even in developing countries. How river management impacts on water quality and sediment transport from the upper basins to coastal areas is not well known in many countries, especially in the developing world, even though this may have strong and long lasting effects on coastal geomorphology and ecosystems. In a time where many people try to explain the coastal recession that is observed on many coastlines, from the sea level rise and thus from “global change”, knowledge of the actual sediment transport to the sea could bring new perspectives, as the reduction of riverine sediment transfer certainly contributes to this recession. One of the associated questions is what is the role of the human impact on these processes? At what speed do these changes take place? This proceeding volume gathers together communications about water quality and sediment transport monitoring and modeling, especially for large river basins, with a focus on the relationships between estuarine river systems and coastal areas in terms of water quality and sediment load. There are also studies presenting diverse methods for estimating the amount of sediment released to the sea and its variability in time. Water security and the food–water–energy nexus: drivers, responses and feedbacks at local to global scales. The papers presented in this special issue were part of a symposium held during the IAHS Scientific Assembly in Port Elizabeth, South Africa, in July 2017. Contributions were invited that investigated the issue of water security and more broadly the food-water-energy nexus; including investigation of water quality as well as quantity, hydro-economics, education, transboundary issues, the influence of processes operating at local to global scales, as well as those that compared conclusions drawn from local and global studies. The papers presented in this special issue cover a wide range of topics, and have a broad geographical focus. We are thrilled to invite you to the STAHY 2018 conference in Adelaide, Australia. Abstract registration is now open. 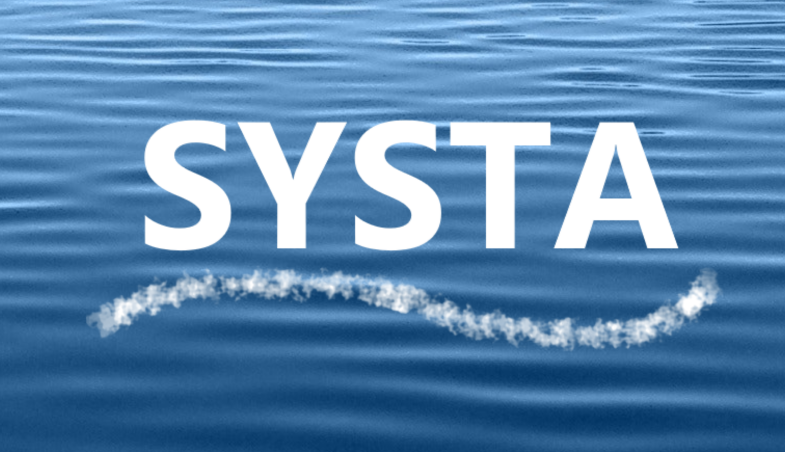 The International Commission on Statistical Hydrology (ICSH) of the International Association of Hydrological Sciences (IAHS) invites researchers to submit abstracts for presentation at the ninth edition of the STAHY International Workshop, STAHY 2018. STAHY 2018 will bring together the experts – academics and practitioners – and young scientists alike for vibrant scientific discussions and debates. STAHY 2018 will be held in Adelaide, South Australia from 24-26 September 2018. Please note that all abstracts are welcome and should conform to the required format and be uploaded to the online submission system. STAHY 2018 will also celebrate the contributions of Prof George Kuczera, a stalwart of the Australian and international hydrological communities. George has made tremendous contributions to hydrological research and practice over the last 40 years, and this workshop will provide an opportunity for all of us to celebrate these achievements. The workshop will be held in the Beachside Function Centre of the Glenelg Pier hotel, which is located on the Glenelg foreshore and offers stunning ocean views. We look forward to receiving your abstracts and seeing you in Adelaide. We at the International Association of Hydrological Sciences take great care to protect your privacy. The new General Data Protection Regulation ("GDPR") which comes into effect on Friday 25th May 2018 changes the way organisations can use your data. In summary, we do not share your personal details with third parties with the exception of Samui, the managers of the iahs.info website and Taylor & Francis to facilitate the access to HSJ online where required, and they have an obligation to IAHS to only use the data for the purpose for which it was transferred. The IAHS does not collect your financial information as membership is currently free. Payments for publications and subscriptions are processed by PayPal or credit card and your details are not stored or retained. If you want to continue receiving messages from us, you don't need to do anything. If you want to stop receiving some or all of our messages, please follow the instructions below. Click here (https://iahs.info/ezines/unsubscribe.do) to unsubscribe from all of the email distribution lists. To have all your membership information permanently deleted email info@iahs.co.uk. Please find below two announcements of Summer Schools. The Summer School on Runoff Predictions in Ungauged Basins will run at the TU Wien, Austria from July 1-6, 2018. The purpose of the Summer School is to learn methods for estimating runoff characteristics in the absence of local runoff observations. The 9th Annual Catchment Science Summer School will run at the University of Birmingham UK from Aug 26-31, 2018. The course is designed for PhD students and Post Docs in catchment science. Congratulations to the recipients of the International Hydrology Prize (Dooge medal and Volker medal) and Tison award for 2018! 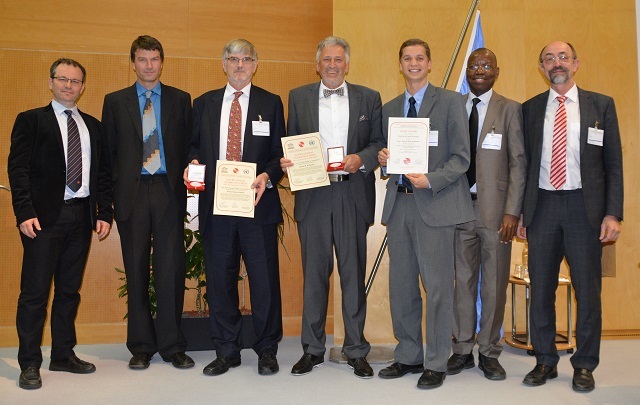 Left to right: Christophe Cudennec (Secretary General IAHS), Johannes Cullmann (Director, Climate and Water Department WMO), Howard Wheater (Dooge Medal Recipient), Andreas Schumann (Volker Medal Recipient), Ryan T. Bailey (Tison Award Recipient), Abou Amani (Chief of Section HSS, UNESCO), Günter Blöschl (President IAHS). The paper is available open access. The articles are available for download and printed versions of the volumes are available from Copernicus. The IUGG Annual Report 2017 is now available at http://www.iugg.org/publications/reports/report2017.pdf It provides a summary of the activities of the Union, its Associations, Commissions and Programs. IUGG thanks all who contributed to the report. A post conference technical tour will be arranged to visit water related projects and facilities of Beijing. We had excellent meetings on Friday 13 April 2018 (Splinter meeting at EGU in Vienna) and on Saturday 14 April (Vienna Catchment Symposium at TU Wien) with about 60 and 110 people attending, respectively. These are the questions resulting from the LinkedIn discussion, the Friday Splinter meeting and additional email contributions received before Friday. On Saturday we had three rounds of discussions in four break out groups and one final plenary discussion. In each round we discussed the questions, merged them, split them and reworded them as needed followed by a voting on prioritising the questions. The voting was for gold/silver/bronze/remove in each of the three break out group rounds. Only the gold and silver ones were retained for the plenary with an additional round of voting (by the entire plenary) for gold, silver or removing them from the list. The idea of the process was to whittle down the 260 questions initially proposed to a more coherent and smaller set of those questions deemed most important by the participants. The process resulted in 16 gold and 29 silver questions which are posted here. - start with an initial draft of the summary paper. The updated list of questions will be circulated among the co-authors (those who have substantially contributed to the process which will be around 160 scientists) with a final voting on the list, and the co-authors will also be asked to provide suggestions for any changes to the paper draft. The plan is to submit the paper to HSJ. In November 2017 IAHS launched an initiative to generate the 23 unsolved problems in Hydrology that would revolutionise research in the 21st century with a YouTube video. We have since been gathering a list of questions and discussion through the IAHS LinkedIn Group https://www.linkedin.com/groups/13552921 . 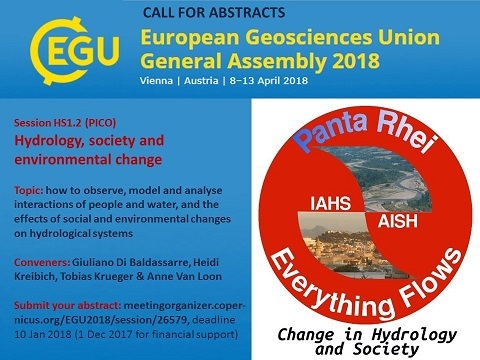 The list will be discussed during the Splinter meeting on Friday, 13th April 2018 at EGU in Vienna and further discussed and finalised at the 2018 Vienna Catchment Science Symposium - "23 unsolved problems in Hydrology that would revolutionise research in the 21st century", on Saturday, 14th April, at Vienna University of Technology http://www.waterresources.at/fileadmin/user_uploads/News_items/VCSS_Programme_2018_v4.pdf . The forum welcomes inputs and discussions until next Thursday, 12th April before the meetings in Vienna on Friday and Saturday. The registration for the "International Conference on Natural Hazards and Risks in a Changing World" is now open! The conference will be held at the University of Potsdam (Campus Griebnitzsee) in Potsdam, Germany, from 4-5 October 2018. The purpose of this conference is to bring together researchers from natural sciences (e.g. hydrology, meteorology, geomorphology, hydraulic engineering, environmental science, seismology, geography), risk research, nonlinear systems dynamics, and applied mathematics to discuss new insights and developments about data science, changing systems, multi-hazard events and the linkage between hazard and vulnerabilities under unstable environmental conditions. Knowledge transfer, communication and networking will be key issues of the conference. The conference will be organized by means of invited talks given by outstanding experts, oral presentations, poster sessions and discussions. For organizational reasons, attendance is limited in number. We are happy to announce that the German Committee for Disaster Reduction (DKKV) will award the Young Professionals Award “Preparedness 2030“ at the conference. DKKV wants to highlight and promote outstanding theses in any field consistent with disaster reduction. The call for contributions and further information can be found at www.dkkv.org . 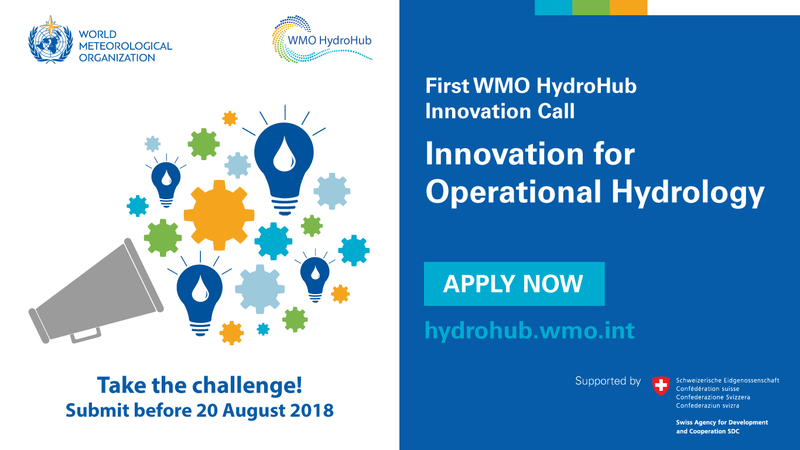 The application deadline for the “Preparedness 2030“ Award is 1st of August 2018. More details about the conference can be found in the attached flyer. We are looking forward to welcoming you in Potsdam! 'In December 2016, the United Nations General Assembly unanimously adopted the resolution “International Decade (2018–2028) for Action – Water for Sustainable Development” to help put a greater focus on water during ten years. Emphasizing that water is critical for sustainable development and the eradication of poverty and hunger, UN Member States expressed deep concern over the lack of access to safe drinking water, sanitation and hygiene and over water related disasters, scarcity and pollution being exacerbated by urbanization, population growth, desertification, drought and climate change. The new Decade will focus on the sustainable development and integrated management of water resources for the achievement of social, economic and environmental objectives and on the implementation and promotion of related programmes and projects, as well as on the furtherance of cooperation and partnership at all levels in order to help to achieve internationally agreed water-related goals and targets, including those contained in the 2030 Agenda for Sustainable Development. In the resolution, UN Member States invited the Secretary-General, with the support of UN-Water, to take appropriate steps, within existing resources, to plan and organize the activities of the Decade at the global, regional and country levels. The World Water Development Report was presented at the 8th World Water Forum, in Brasilia, Brazil on the 19th of March 2018. IAHS contributed to the report as an official partner of UN Water. 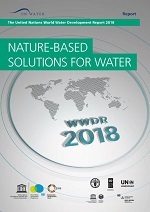 The WWDR2018, Nature-based solutions for water, demonstrates how nature-based solutions (NBS) offer a vital means of moving beyond business-as-usual to address many of the world’s water challenges while simultaneously delivering additional benefits vital to all aspects of sustainable development. IAHS are pleased to announce the recipients of the International Hydrology Prize (Dooge medal and Volker medal) for 2018. Nominations for the annual Prize are made by National Committees to IAHS, National Committees to the UNESCO-IHP or National Hydrological Advisors to the WMO, and forwarded to the Secretary General of IAHS for consideration by the Nomination Committee. The Committee consists of the President and a Vice-President of IAHS and representatives of UNESCO and WMO. As of 2014, two medals are awarded under the International Hydrology Prize: the Dooge medal and the Volker medal. Both medals are intended to distinguish outstanding achievements by hydrological scientists but with a different focus. The Dooge medal is aimed at fundamental contributions to the science of hydrology, whereas the Volker medal is aimed at outstanding applications of hydrological science for the benefit of society at large. Our warmest congratulations go to both recipients. Registration and abstract submission for the ICCE Symposium are now open. Entitled "Climate Change Impacts on Sediment Dynamics: Measurement, Modelling and Management" the symposium will take place from 27 to 31 August 2018 in Moscow, Russia. - Erosion and sediment transport models and river basin management tools. The ICCE Symposium will be accompanied by The Second International Young Scientists Forum on Soil and Water Conservation which will address mechanism/processes and modelling of soil degradation, innovation of technology of soil and water conservation, ecological restoration and regional sustainable development. Please, distribute this information to your colleagues and international partners. We are looking forward to meeting you in Moscow in August 2018. In 2013, the International Association of Hydrological Sciences (IAHS) established the Measurements and Observations in the XXI Century (MOXXI) working group with the specific aim to promote the advancement of novel observational techniques toward an improved comprehension of the hydrological cycle. Since then, MOXXI has attracted a vibrant multidisciplinary and international community and has organized special sessions at international conferences (EGU, AGU, and IAHS General Assembly) and focal workshops. A recent currently free-to-view community paper in the Hydrological Sciences Journal (http://www.tandfonline.com/doi/full/10.1080/02626667.2017.1420191 ) offers a synthesis of MOXXI objectives: a proactive behavior toward observations, multidisciplinarity and contamination from other fields of science, and the use of affordable and opportunistic technologies to enrich our understanding of hydrological processes. In November 2017 IAHS launched the new initiative to generate the 23 unsolved problems in Hydrology that would revolutionise research in the 21st century with a YouTube video. The generation of questions is open to everyone and will be distilled through discussion on the IAHS LinkedIn group https://www.linkedin.com/groups/13552921 We aim to finalise the questions in Spring 2018. There is still time to add your own draft question or add a comment to the existing discussion on the group so please join the conversation. The abstract submission deadline for EGU2018 sessions is 10th January 2018. The following sessions are especially related to Panta Rhei. This is a reminder about the ongoing Panta Rhei Survey. You can help us identify hotspots of water crises around the world by filling in the attached questionnaire before January 8. It takes only 5-10 minutes! This Panta Rhei Survey is a step towards a community-wide effort to share data and advance our understanding of social, technical and hydrological factors underlying the emergence of different phenomena. If you know of any water crisis, please fill in the questionnaire (see attachment) and send it back by email to giuliano.dibaldassarre@geo.uu.se by January 8. All contributions will be properly acknowledged.